PlantFactory is packed with amazing features that deliver unsurpassed realism and performance. An essential tool for any VFX pipeline, PlantFactory will have you creating stunning digital art in a flash! Because we understand that our tools will find their place with bigger arsenal in your pipeline, we made sure that what you do in PlantFactory does not merely stay in PlantFactory! Plants created with PlantFactory can be exported to any 3D application using export formats such as Alembic, FBX, 3DS, OBJ, C4D, LWO, etc. Plants are exported fully rigged, fully textured, with UV maps and displacement, and with all their LODs. Breeze or wind animated plants can be exported as a fully rigged mesh or as a cloud of animated vertices (MDD style). You can fine-tune the animation of rigged mesh plants directly inside your target 3D application. When used in conjunction with VUE, PlantFactory will fully integrate and expand the software, so that you can access the plant editing power of PlantFactory directly from VUE and use the VUE tools to affect the PlantFactory vegetation. Furthermore, when used inside of VUE, PlantFactory creates unique vegetation - i.e. no two plants of the same species will ever look exactly alike. PlantFactory plants also sway in the breeze, or twist and bend in strong winds. PlantFactory plants will automatically adapt their resolution with distance, through a dynamic LOD system, making them perfect for Hero plants, foreground, mid-ground and background placements in your compositions. PlantFactory vegetation can be edited directly within the VUE Plant Editor. Specific parameters from the plant graph can be extracted to the Plant Editor to create simplified, high-level controls and facilitate your plant editing process. Last but not least, like any VUE component, PlantFactory plants will work seamlessly with the EcoSystem™ technology to create landscapes containing millions of unique plants! One of the key features of PlantFactory is its ability to dynamically set global plant characteristics such as plant age, health, and seasonality. These characteristics can drive any node or set of nodes in the TPF graph to add more complete plant definition and realism. In Manual mode, you just paint branches using your mouse (or tablet). The graph of nodes is automatically regenerated after each mouse stroke. Once painted, you can access each painted element and easily fine tune every aspect of it using graph parameters, or even visually modify the geometry using standard manipulation Gizmos. The Components method is the fastest and easiest way to model vegetation. PlantFactory ships with a library of pre-made components for trunks, branches, leaves, fruits, etc. Components are fully textured, UV mapped, displaced, and pre-animated. Just select the component you want to use, and TPF will intelligently add it to the graph and connect its parameters automatically, without any further action from you. Using the graph of nodes, you build your plants from simple geometry nodes. Each geometry node features multiple parameters that you adjust and combine to achieve the desired look. Each one of these parameters can be extracted and controlled using other nodes (for instance, you can link the size and color of your leaves to the age of your plant). 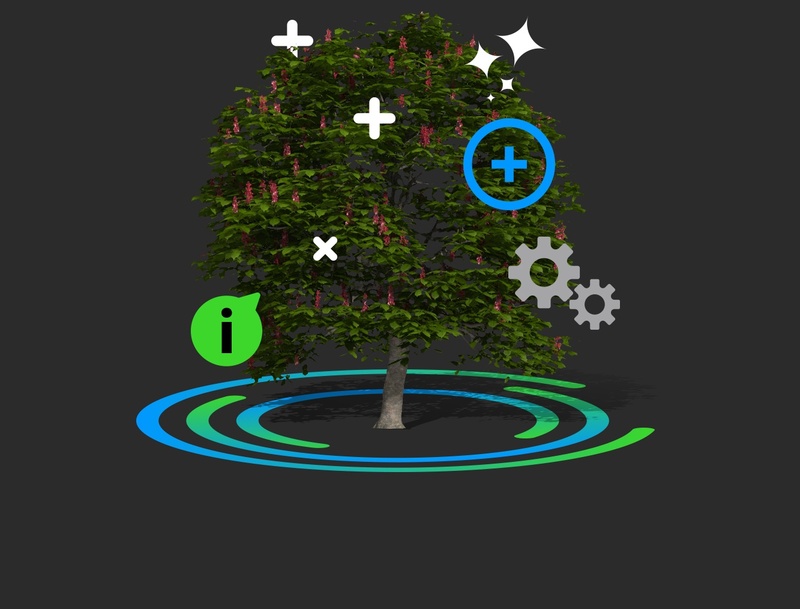 You can even create simple interfaces to control your plants: by publishing specific parameters of the graph you provide high level control to the intricate properties of the plant. PlantFactory is a 64 bits application, designed for 64 bit versions of Windows 7, Windows 8 and Windows 10 and Intel Mac OS X 10.10+ platforms. A video board that can run Shader model 4 is required. For better performance, a minimum of 2GB of video RAM is recommended (Video RAM should not be confused with system RAM. Video RAM resides solely on your video board). Performance of the software is directly related to the power of the system running it. PlantFactory is optimized to make the best of all the processors/cores on your system. The power of your video board directly impacts the frame-rate of the plant preview. 4GB of free Hard Disk space. Comprises VUE Creator and PlantFactory Creator - an attractive solution for artists to continue creating at a reasonable price. Includes VUE and PlantFactory - a solution for professionals and freelancers to enhance their artwork at any point within their workflow. Bundles VUE, PlantFactory, 25 rendernodes, network rendering licenses, and an ever-growing library of new vegetation species.